Home › News › How to make dichroic glass hair barrettes. 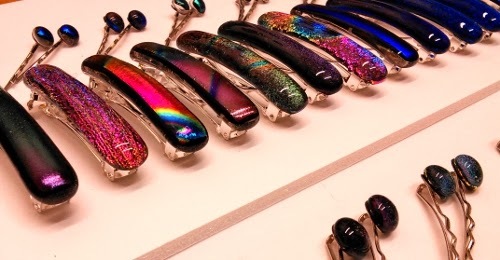 How to make dichroic glass hair barrettes. 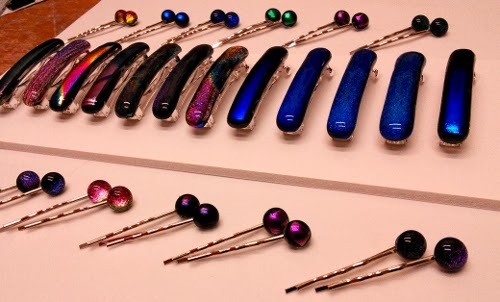 A short story of how I make Dichroic Glass Hair Barrettes. 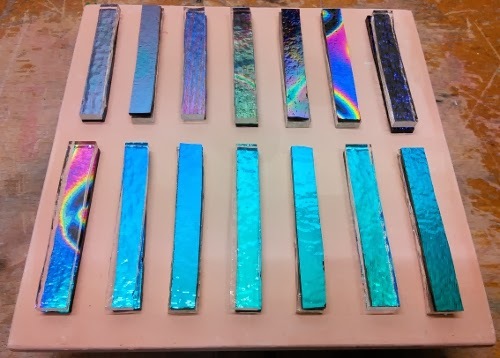 First things first, pick a selection of different coloured dichroic glass sheets and cut into 5/16" x 2"3/8" pieces. 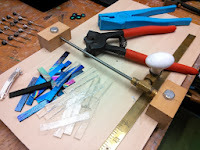 Then cut matching Tekta glass to make the pieces thick enough for the fusing process. 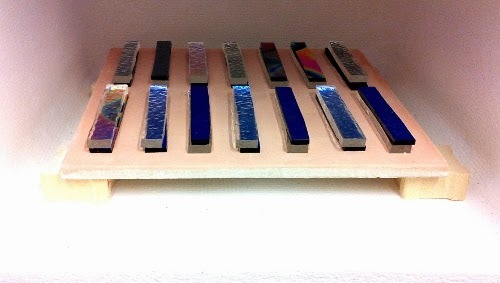 Set all the pieces out on a kiln washed firing tile. 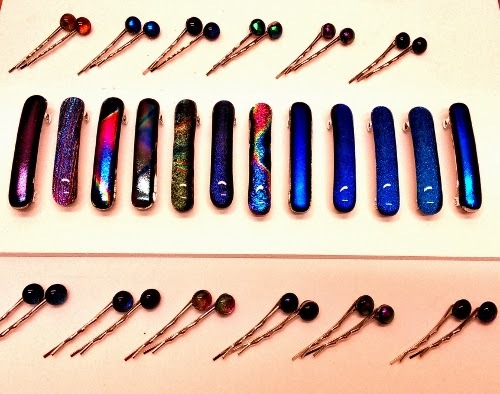 Yes, nicely regimented and possibly a bit OCD at this point. Then, carefully place in the cool kiln, making sure no pieces of glass has slipped. This final check of the unfused glass is is very important as once the temperature starts rising in the kiln, it's a bit late to be sticking your hands in to adjust something you have just spotted. Trust me, I know from experience LOL. 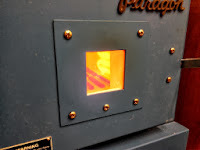 As you can see from the first picture of the closed kiln, it was a warm day as the ambient temperature was 17 degree centigrade. 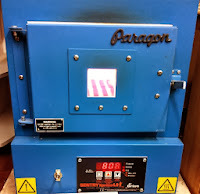 These two pictures show the kiln at full fusing temperature. 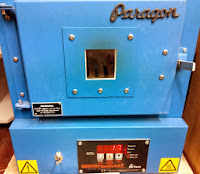 After the holding time the door was opened very slightly to crash cool the glass to about 370 degrees centigrade. 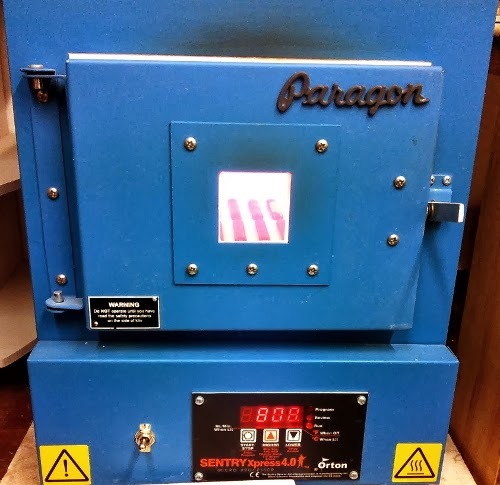 Then closed again to anneal for about 20 minutes. 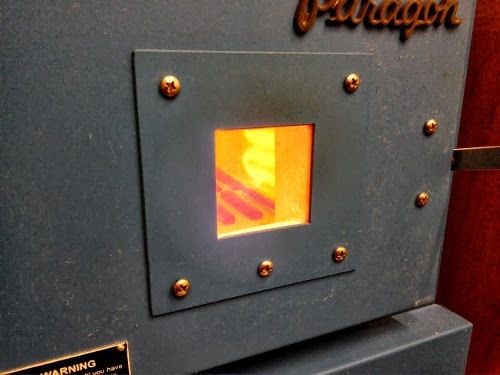 The door was then opened again, very slightly as I did not want any temperature shock to shatter the glass and left to cool to room temperature. 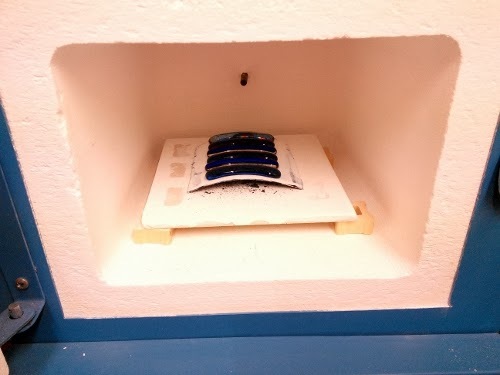 Once the kiln had cooled. The glass could be seen in all it's sparkling glory. 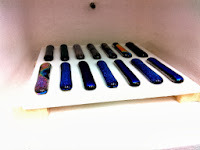 These long thin dichroic glass cabochon are to be glued onto these convex hair clips. 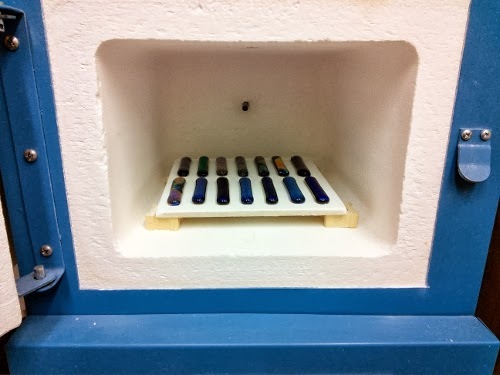 And what you see in the kiln are very flat cabochons. How to bend glass very simply. 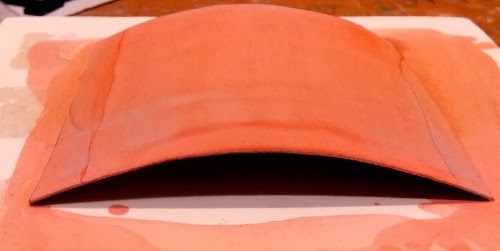 I have a small square of copper, about 4" square which I curve to the same curvature as the hair clips. 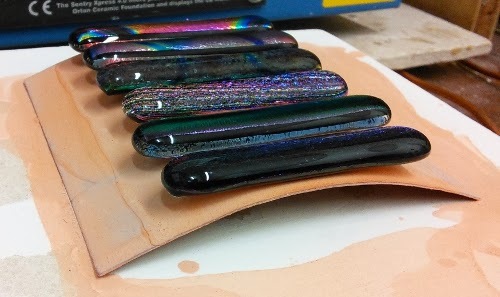 Not sure if it's necessary but I then apply 5 coats of kiln wash, drying each coat before then next one is applied. 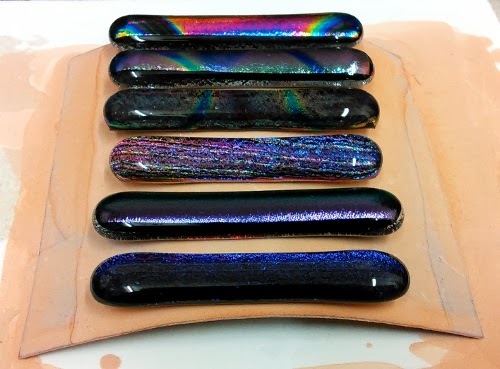 I added this kiln wash as I really don't want these cabochon stuck to anything. A very strong coffee was introduced at this point to steady my hands. 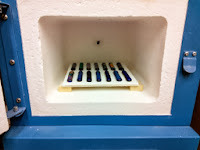 With steady hands I laid the flat cabochons on the former and placed them in the kiln for the slumping process. 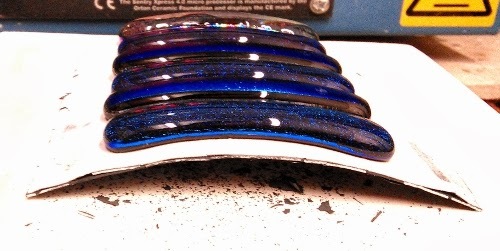 Out of the kiln they came slumped nicely into the convex shape that I needed for these hair barrettes. 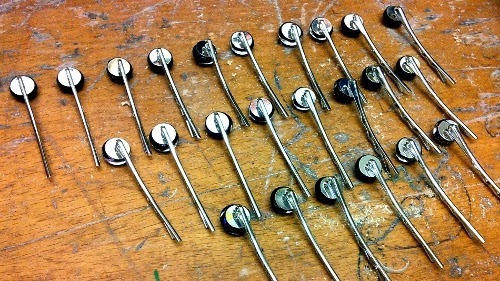 Whilst I was waiting for the kiln to finish I managed to glue a few pairs of Bobbin Hair clips as well. I know what you thinking, a man multi-tasking. 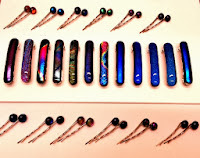 If you would like to see other designs then click on my website link. 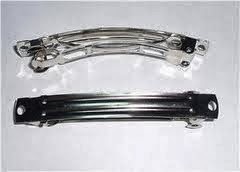 The very latest designs are usually place of Facebook first as this is the quickest. 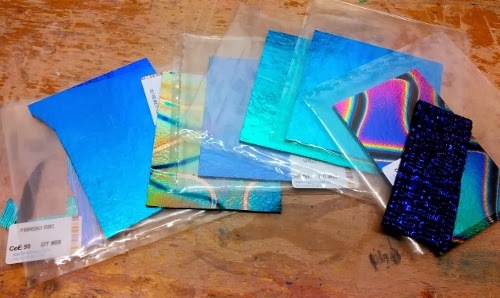 Thanks for taking time out to read my latest blog post and hope you visit again.